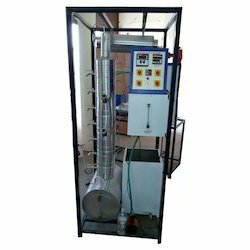 Pioneers in the industry, we offer rotary dryer, packed distillation column, sieve plate distillation column, bubble cap distillation column, solid liquid extraction bonnoto type and steam distillation set up from India. 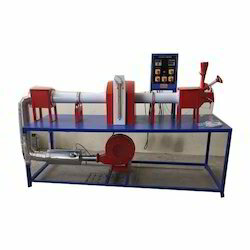 DESCRIPTION :Rotary dryer is a unit in which drying is done by forced draft action created by hot air. The set-up consists of a long revolving cylindrical shell slightly inclined towards the outlet. The shell is fitted with two brackets for support. 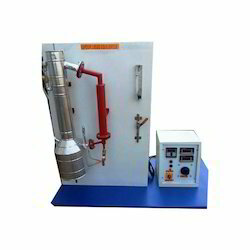 Air from a blower passes through a heating chamber serves the purpose of drying agent. An arrangement for rotating the dryer shell at low RPM is provided by means of an electrical motor and a reduction gearbox.Wet feed enters from one end of the cylinder and dry material discharges from the other end. As the shell rotates internal flights lift the solids and shower them down through the interior of the shell. This action increases the contact of wet solid against hot air making the dryer very effective. The flow of hot air is counter-current to solids. Flow control and by-pass valve are fitted to regulate the airflow. 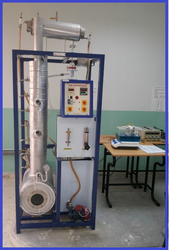 The setup is designed to demonstrate principles of distillation in a Packed Column. The column is made of Stainless Steel material packed with Borosilicate Glass rasching rings. An electrically heated re-boiler is installed at the bottom of the column. The bottom product is collected in the tank. 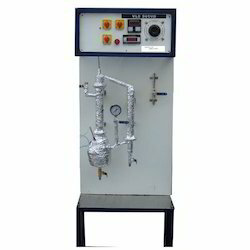 The vapors form the top of column are condensed in the shell and tube type condenser by circulating cooling water and it is supplied by laboratory overhead tank. 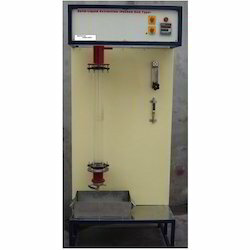 The setup is designed to demonstrate principles of distillation in a Sieve Plate Column. The column is made of Stainless Steel with seven plates for mounting the bubble caps. Each plate is provided with one bubble cap. An electrically heated re-boiler is installed at the bottom of the column. The vapors form the top of column are condensed in the shell and tube type condenser by circulating cooling water supplied by laboratory overhead tank. 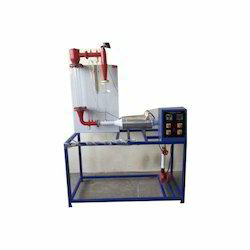 The setup is designed to demonstrate principles of extraction in a Bonnotto type extraction column. It consists of a SS column, feed tank with heating arrangement, receiving tanks and piping. Rotameter is provided for flow measurement. The column is divided into multiple stages; each stage consists of a plate and a mechanical agitation section. The circular plates are arranged one above the other in opposite radial opening, yield higher extraction efficiency than conventional packed column. 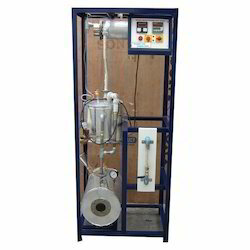 The equipment consists of jacketed pressure vessel for distillation. Steam from a steam generator can either be allowed to enter 'in the outer jacket or in the vessel. The vapors form the top of the vessel are condensed in the shell and tube type condenser by circulating cooling water supplied by laboratory overhead tank. The setup contains all necessary accessories to determine the diffusion coefficient of components in the liquid phase. 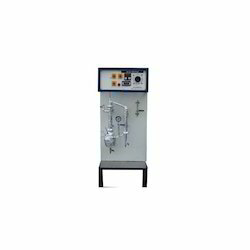 The discussion cell is a well designed one to avoid any error during equimolal counter current diffusion between liquids of different concentration on each side of the cell. The diffusion vessel is of high quality Borosilicate Glass with a porous cell made up of ceramic. 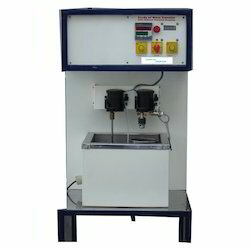 The Concentration of Solution is precisely measured with a precision Conductivity meter provided along with the setup. Diffusivity of the vapors is determined by WINKELMANN method in which liquid is allowed to evaporate in a graduated vertical glass tube over the top of which a stream of air is passed. single phase electric supply with proper earthing. The set up consists of a glass column, feed tank, receiving tanks and piping. Rotameter are provided for flow measurement. The glass column is fitted with SS mesh to support the solid material. 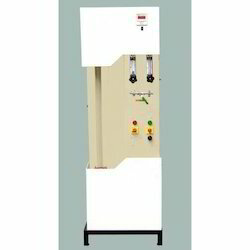 Electricity Supply: 1 Phase, 220 V AC, 1.5 kW. Extraction Column: Material Borosilicate Glass. Solvent Flow Measurement: Rota meter. 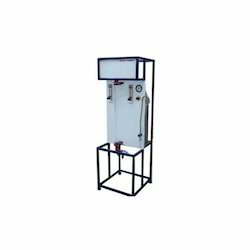 Solvent Tank: Made of Stainless Steel, Capacity 30 Ltrs. Double wall. 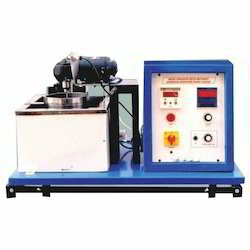 Solvent circulation: Magnetic Pump made of Polypropylene to Circulate solvent. Temperature Sensor: RTD PT-100 Type. The set-up is designed to demonstrate and stimulate the moisture removal by heat under natural draft action created by hot air stream.The set-up consists of an insulated double wall chamber. Inside the chamber a tray is attached directly to an electronic weighing balance, which is fitted on top outside the chamber. 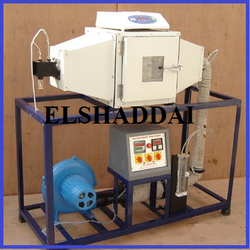 Material for drying is placed in the tray and regular loss of weight is monitored. The setup is designed to demonstrate principles of extraction and mass transfer operation in a YORK SCHEIBEL'S column. The set up consists of a glass column, feed tanks, air regulator with pressure gauge, receiving tanks and piping. Rota meter are provided for flow measurement. Compressed Air supply: Clean, oil and moisture free air, pressure 2 Bar. Tthe vapor–liquid equilibrium (VLE) describes the distribution of a chemical species between the gas phase and a liquid phase. The concentration of a vapor in contact with its liquid, especially at equilibrium, is often expressed in terms of vapor pressure, which will be a partial pressure (a part of the total gas pressure) if any other gas(es) are present with the vapor. The equilibrium vapor pressure of a liquid is in general strongly dependent on temperature. At vapor–liquid equilibrium, a liquid with individual components in certain concentrations will have an equilibrium vapor in which the concentrations or partial pressures of the vapor components have certain values depending on all of the liquid component concentrations and the temperature. Such VLE diagrams are square with a diagonal line running from the (x1 = 0, y1 = 0) corner to the (x1 = 1, y1 = 1) corner for reference. These types of VLE diagrams are used in the McCabe–Thiele method to determine the number of equilibrium stages (or theoretical plates) needed to distill a given composition binary feed mixture into one distillate fraction and one bottoms fraction. Corrections can also be made to take into account the incomplete efficiency of each tray in a distillation column when compared to a theoretical plate. This apparatus is used to estimate the liquid film mass transfer coefficient for oxygen (from air flowing upward) absorbed into deoxygenated water (flowing downwards). Looking for Mass Transfer Lab ?